On a grand and gala event of European Professional Doctorate (EPD) 3rd Convocation Ceremony by the Aldersgate International Consortium (Europe, Africa and Asia) in conjunction with their Regional Partners Hali Management Consultancies (HMC) and supported by the India Trade & Exhibition Center m.e, Sharjah and HMC’s Media Partner Cochin Herald, was held at the Palm the Atlantis Hotel, Dubai on 16th April 2016 from 7 PM. 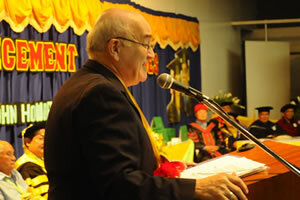 Succeeding at its three-fold objective academic excellence, social relevance, and spiritual nurture, Aldersgate College sent 269 graduates into the real world during the Commencement Exercises last April 23 at the CAP Building, Maharlika Highway Solano, Nueva Vizcaya with Mr. Howard Vincent Savage, a consultant of International Hotel and Management as the Guest Speaker. 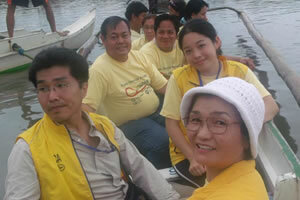 On August 26, 2012, the Institute of Cultural Affairs –Japan (ICA) team headed by Director Shizuyo Sato with Program Coordinator Gaco Moriguchi and Local Coordinator Erina Saita and Aldersgate College representatives President Junifen F. Gauuan, Ph.D. with Dr. Jolly Gauuan, Ms. Carmencita G. Mendoza and Mr. Elly Nacino went to the City Mayor’s office to inform them of the Relief Distribution Project. The mayor, Hon. 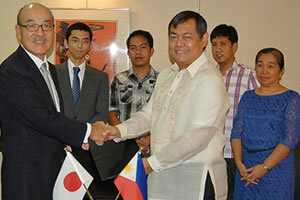 Atty Christian D.
Japanese Ambassador Toshinao Urabe congratulates Dr. Junifen F. Gauuan, President, Aldersgate College after signing the grant contract for “the Project for Construction of Women's Training Center in Quezon, Nueva Vizcaya ” on March 5, 2013 at the Embassy of Japan. The signing was witnessed by Mr. Albert Cahilig, Architectual Designer, Mr. Mark Ordonez, Project Accounting, Dr. Polivina Jolicia F. Gauuan, Ms. Framiliza F. Gauuan, Ms. Emily G.